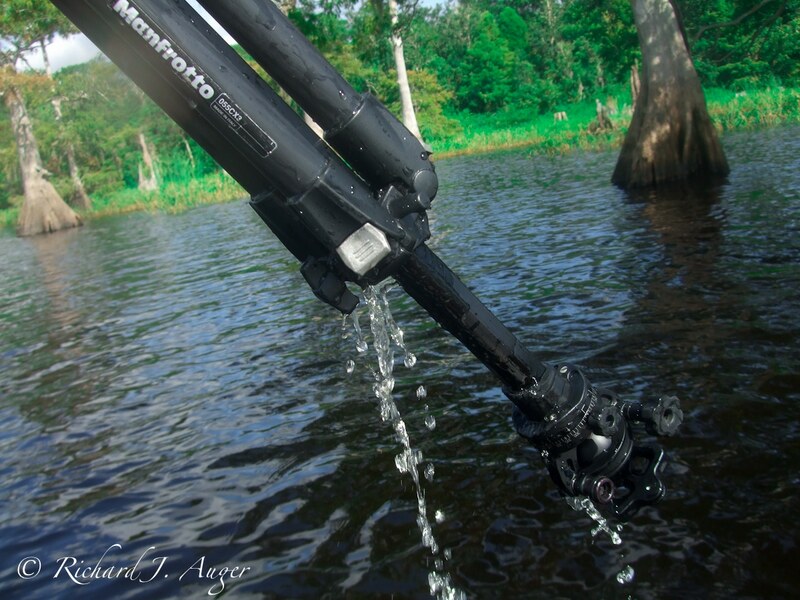 The summer of 2012 was a prolific shooting season in my continuation of the Florida 67 Series, but with a focus on panoramic images and water systems. 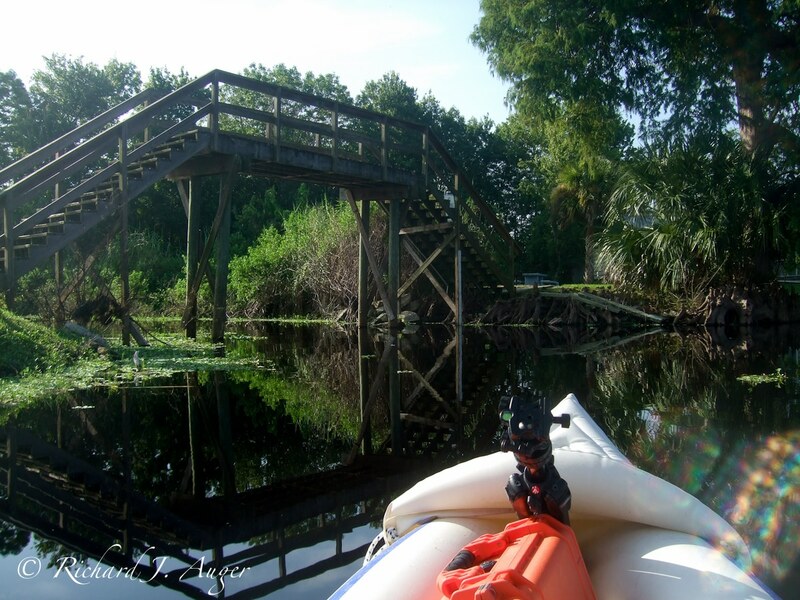 I covered alot of ground, traveling a cumulative 30 days just photographing the Florida coasts, rivers, and wilderness. The rest of my time I’ve spent developing and scanning nearly 80 rolls of 120 film, most of which spun through my recently acquired Horseman SW612, which produces nice 6x12cm negatives (and slides). 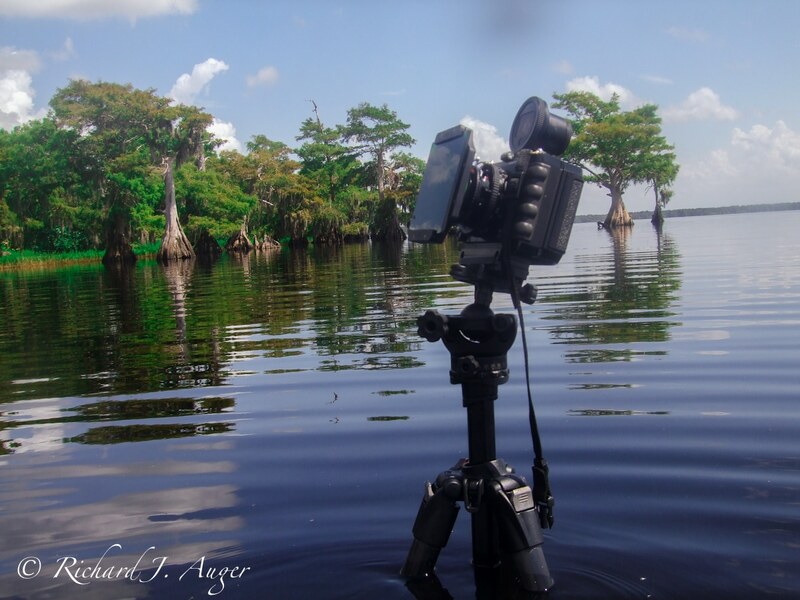 At the Osceola Art Festival, another photographer suggested that I come and visit the Blue Cypress Lake, known for its unusual cypress trees and jewel blue water. I made a mental note to eventually visit last summer, and I finally made a day trip over in early August 2012. 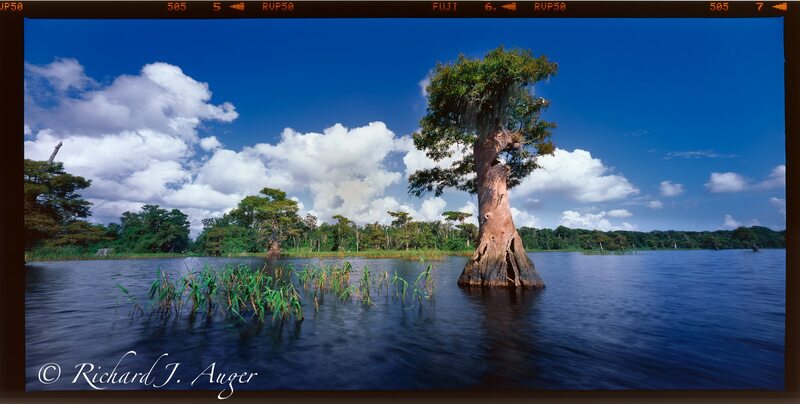 Located in Indian River County, Blue Cypress Lake covers 6500 acres, and outflows into the St. Johns River. An early morning, 90 minute drive was a nice beginning that reminds me how many hidden treasures are close to my home in southeast Orlando. Blue Cypress in Indian River County. Horseman SW612, 35mm Rodenstock. Schneider Center ND. Ilford Pan F+ 50, Kodak XTOL 1:1. Not too far from the boat ramp, a beautiful row of interesting cypress began, and I paddled beside and through the trees. 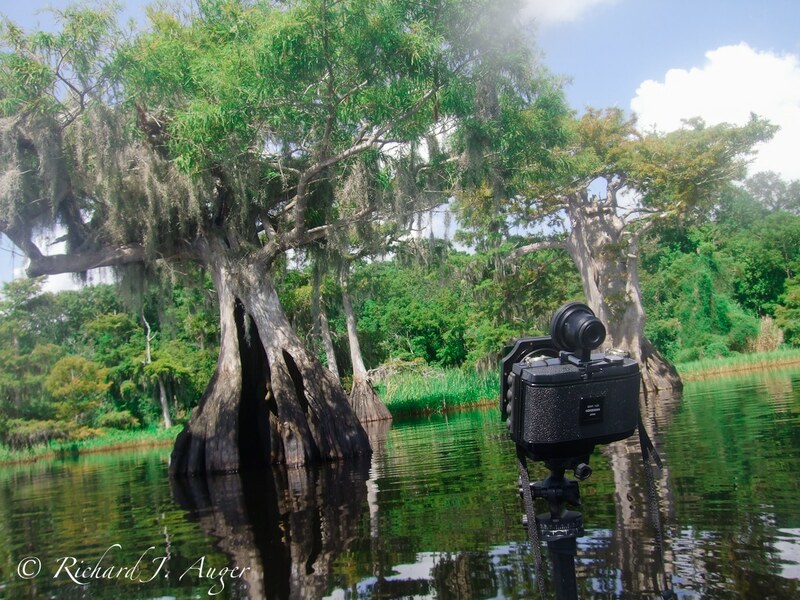 These waters were loaded with gators, and the water was very deep (99% of my photographs used a tripod). I continued scouting along the lake, and noticed this nearly perfect composition. A thunderhead began to form above the large, split cypress tree, and I was ready to jump out until I saw two alligators within 15 feet, one on the left and out on the right, with only their eyes and snouts exposed. A long trip down the Ichetucknee a week earlier had started to break my fear of these creatures, and I jumped into the water and set up my tripod in about 4.5 feet of water. They seem to not mind my presence, and slowly floated further away. I loaded the film, waiting for the clouds to move into just the right position. The final results is above. 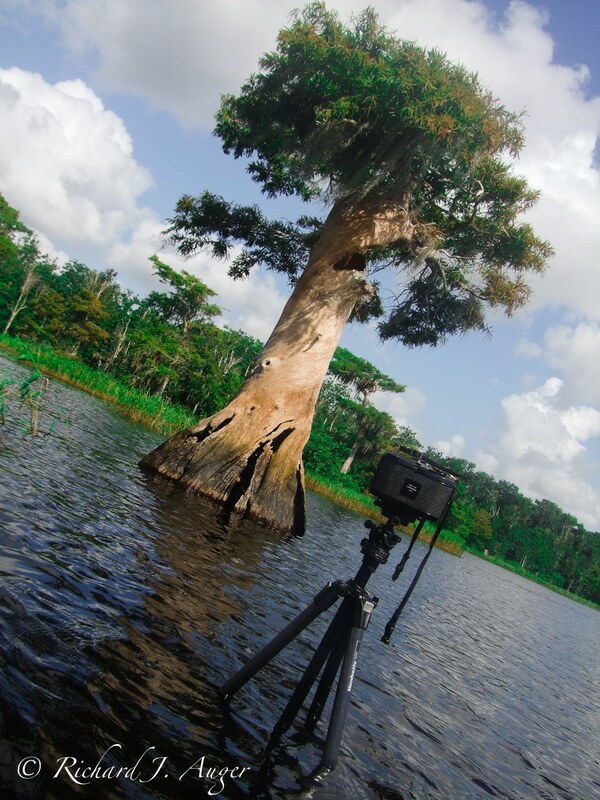 I continued shooting along spots I had scouted earlier along the lake, including this unusual cypress below. The water was a wonder shade of blue, and the grass was green and luscious from heavy summer rains, so I ran a roll of Veliva 50 speed slide film through the camera and backtracked some photos. See the two below. Blue Cypress Lake 2 in Indian River County. Horseman SW612, 35mm Rodenstock. Schneider Center ND. Ilford Pan F+ 50, Kodak XTOL 1:1. Blue Cypress Lake, Indian River County, Florida. Horseman SW612, Velvia 50 Slide Film. Schneider Center ND filter. Facebook and newsletter fans are always telling me to add more behind-the-scenes, photos, so here ya go. These are some of the last I’ve taken with my old Fuji Point and Shoot before getting the waterproof Nikon AW100. Blue Cypress Lake. Really high water here, with gators to the left and right. Photo by Richard Auger. 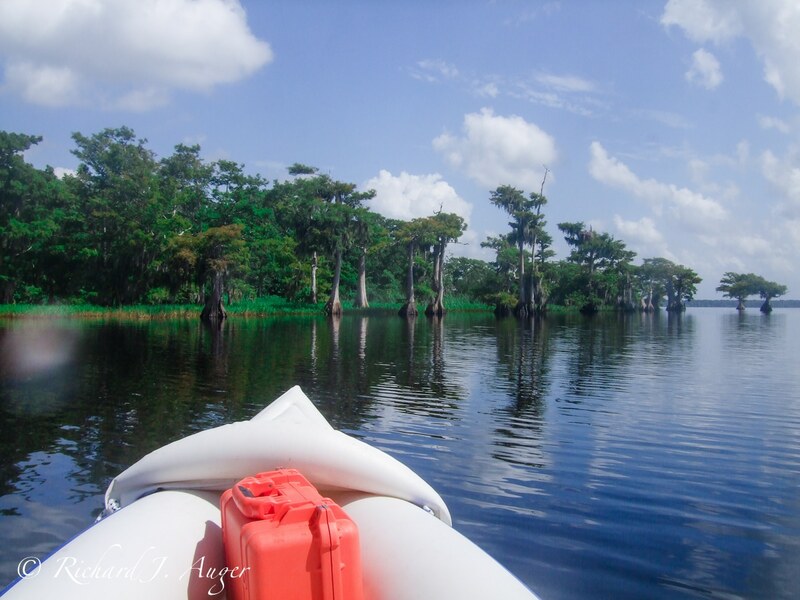 Blue Cypress Lake, gliding in my kayak. Photo by Richard Auger. Blue Cypress Lake. Photo by Richard Auger. Blue Cypress Lake. My tripod is full of water from sitting at 4.5 feet. Photo by Richard Auger. Blue Cypress Lake – Exit Bridge. Photo by Richard Auger.